A new not-for-profit online journalism start-up launches today in Australia, backed with $15 million of funding from a philanthropist to see the site through its first five years. 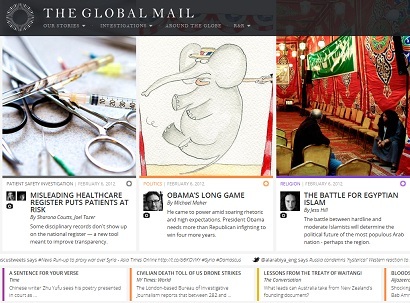 The Global Mail is edited by former ABC broadcast journalist Monica Attard and aims to provide “public interest journalism – no ads, no subscription, no celebrity stories, no spin”. She adds: “We would like to think we can come up with novel ways to help pay our way in the world. We haven’t thought of any yet. That’s the honest-to-god truth. This entry was posted in Investigative journalism, Journalism, Non-profit, Online Journalism and tagged Australia, global mail, propublica on February 6, 2012 by Paul McNally. The Sydney Morning Herald has reported that News Limited (the Australian arm of News Corporation) will officially announce its paywall for the Australian this week, after it outlined plans for a ‘freemium’ subscription model for its online content back in June. It had already been announced that the model will offer access to some content for free, but others will require payment. According to the SMH report the site will charge $2.95 a week to access all content across the website and its phone and tablet apps. It will be the first paywall for a general newspaper in Australia, an experiment that has achieved mixed success overseas by newspapers and magazines including The New York Times, the Financial Times and The Economist. It will follow the approach of News Corp stablemate The Wall Street Journal. Some stories will be able to be read for free while others will need a subscription to be read, most likely to be its analysis and specialised sections. At the World Editors Forum last week, three publishers – including the New York Times – outlined their paywall strategies and lessons they had learnt along the way. This entry was posted in Business, Online Journalism and tagged Australia, digital subscriptions, News Limited, Online Journalism, paid content, paywall, the australian on October 18, 2011 by Rachel Bartlett. Several newspapers published by Australia’s News Limited brought out “rare” afternoon editions today in an attempt to keep print readers updated after Cyclone Yasi hit last night, according to a report by mumbrella.com. A special edition of Sydney’s Daily Telegraph is available in the Sydney CBD, North Sydney, Parramatta and at airports with nine pages of new coverage along with updates on the situation in Egypt and the arrest of Bulldogs player Ryan Tandy. According to mumbrella.com’s report the Australian also published a special lunchtime edition which was distributed in Cairns, Townsville, Brisbane, Sydney, Melbourne and Adelaide. Read the full post on mumbrella.com at this link. This entry was posted in Editors' pick, Newspapers and tagged Australia, Cyclone Yasi, mUmBRELLA, Newspapers on February 3, 2011 by Rachel Bartlett. A look at the Future of Journalism study released by Australian industry group the Media, Entertainment and Arts Alliance, which suggests that despite 700 job losses in the metropolitan news industry in the country since 2008, morale is still relatively high amongst working journalists. This entry was posted in Editors' pick, Newspapers, Online Journalism and tagged Australia, job losses, Jobs, journalism jobs, media jobs on December 9, 2010 by Laura Oliver. ABC news has released a video to advertise their impending 24-hour news channel, ABC 24, in Australia. According to a report by mUmbrella.com.au, the national broadcaster is keeping quiet about the launch date of the all day news channel, although rumours include 14 July as a potential deadline. ABC News 24 claims it will offer news coverage from across 12 foreign bureaus and 60 regional newsrooms. This entry was posted in Editors' pick and tagged 24-hours news, ABC 24, ABC News, Australia on July 8, 2010 by Rachel Bartlett. Investigative journalists Richard Baker and Nick McKenzie talk to broadcaster Peter Clarke about their work on an investigation for Melbourne’s The Age into allegations of international bribery involving Securency, the banknote company half-owned by the country’s Reserve Bank. If you get a chance to listen to the podcast in full it’s a great behind-the-scenes account of how an investigation can develop from the first hint of information to the final story – and why this can sometimes be a slow-burning thing. This entry was posted in Editors' pick and tagged Australia, investigative journalism, nick mckenzie, peter clarke, richard baker, The Age on June 23, 2010 by Laura Oliver. The Murdoch-owned newspaper, the Australian, last month secured a order to prevent the publication of a report about its police scoop in summer 2009. As we’ve previously reported on this blog, on 4 August 2009 Australian police arrested four people in terror raids – a planned operation reported exclusively by the Australian newspaper, part of the News Ltd group. But the police claimed copies of the newspaper were available in Melbourne before the operation had taken place, citing that an “unacceptable risk”. It was an enviable scoop and won journalist Cameron Stewart the ‘Gold Quill’ in the Melbourne Press Club awards. But the Australian Commission for Law Enforcement Integrity (ACLEI) and the and the The Victorian Office of Police Integrity (OPI) produced a report, examining the source of the leak. The Australian newspaper subsequently acquired a Federal Court order prohibiting publication of the report. The OPI then sought to overturn the order. But on 23 April, the Australian won the right to keep the document private. Crikey.com.au journalist Margaret Simons has been reporting – and tweeting – the case. Justice Michelle Gordon said that continued suppression of the Victorian Office of Police Integrity’s report on the matter is necessary because The Australian is arguing that the whole investigation was invalid, and the evidence gathered “tainted”. Justice Gordon’s decision means that it will be at least another three weeks, and probably much longer, before we know the full story of what occurred between Stewart, his source and the OPI. News Ltd has made it clear it will appeal against any judgement that would allow the OPI report to be released. Last week, I asked Margaret Simons, who is a freelancer for Crikey – an independent online news and comment site – about her own views of this complicated case. She says she doesn’t know why the Australian is so keen to suppress the document. Does Simons think the report should be released? “Without knowing all the facts, it is hard to say. The Australian claims the OPI’s investigation was very flawed. Maybe so. The OPI has a chequered record. “There is an irony, though, in The Australian’s leading role in the Right to Know Coalition, pressing governments for more openness, and its contesting of suppression orders in other matters … and its active suppression in this case. “It would be nice to think that the rights and wrongs of this matter could be fought out in open. However, without knowing all the facts of what is contained in the report, it is genuinely hard to judge and I do not have a strong point of view at present. Simons says that Crikey’s editorial position is not so much a matter of opinion, but an attempt to raise awareness. “[I]n a country where the print media is dominated by just two publishers, with News Ltd being overwhelmingly dominant, there is a particular role for an independent outlet such as ours in covering the media’s own story,” she said. This entry was posted in Journalism, Newspapers, Press freedom and ethics and tagged #ozleak, Australia, Cameron Stewart, Crikey, Margaret Simons on May 6, 2010 by Judith Townend.